Zone 1 has the highest concentration of Radon in the ground. 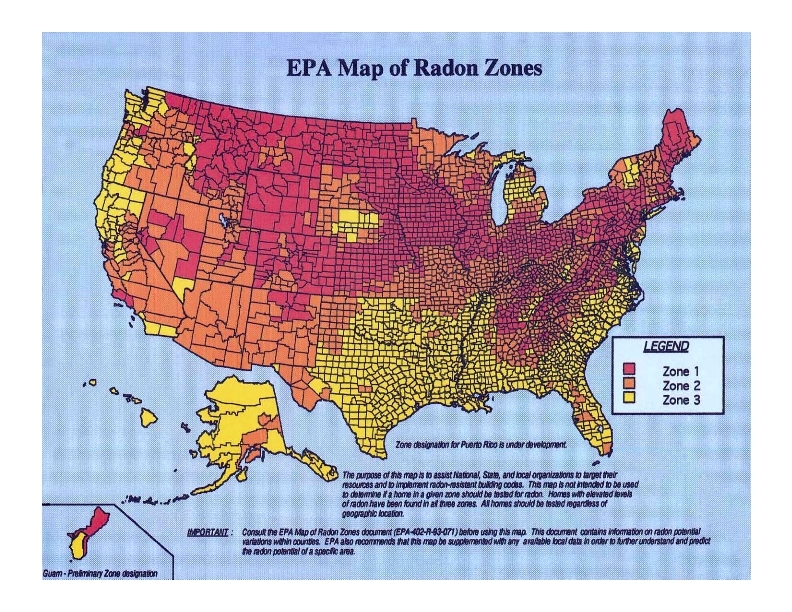 Radon has been found to be a naturally occurring cancer causing element that is concentrated in homes that have direct contact with the earth especially in Level 1 (Red) zones. 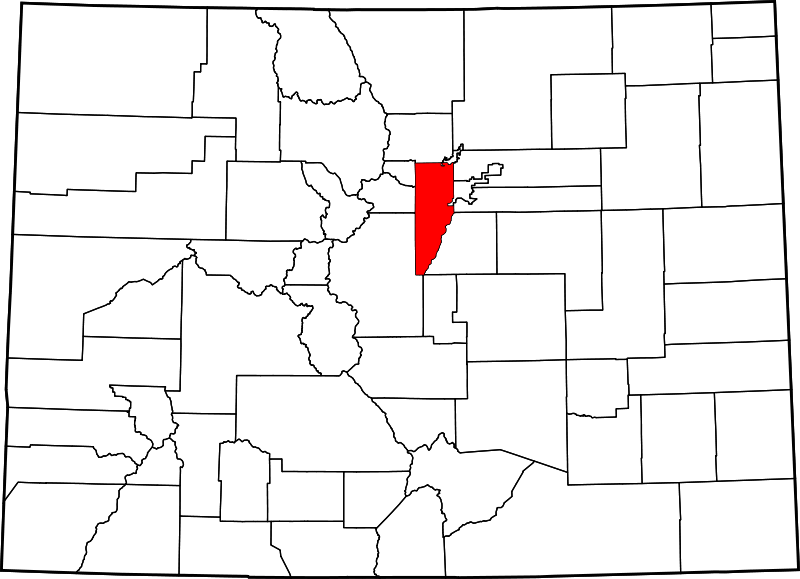 Jefferson County is a high concentration area and Radon Mitigation was one of the LEED Durability Issues cited during the design charrette and noted as requiring extra design attention. 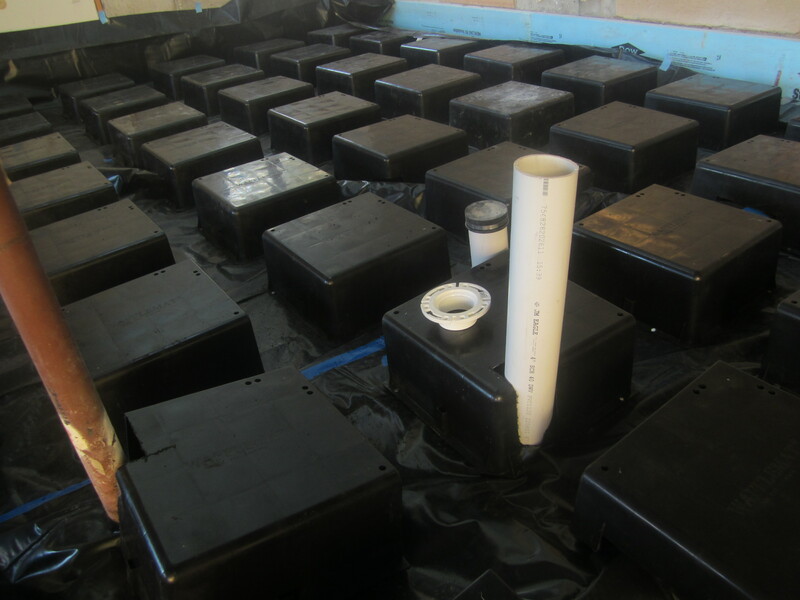 Although there is some evidence that a thick vapor barrier is sufficient protection from radon, the most commonly accepted method is passive or active gas exhaust from beneath the slab. The best information that I found for installing a sub-slab depressurization system for radon mitigation was a report to the GSA. 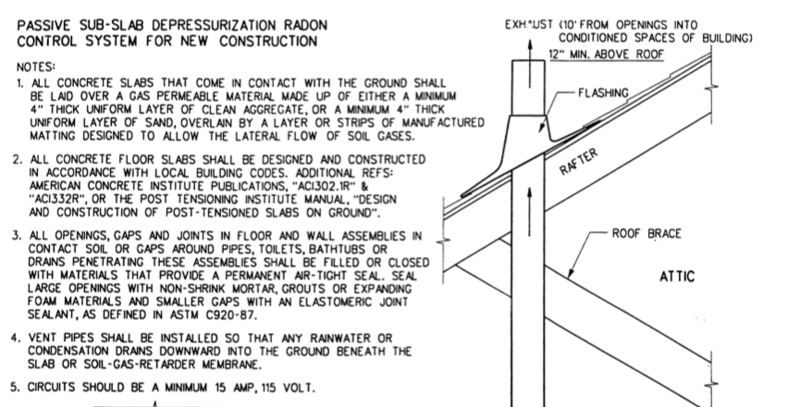 I also found the details of the installation method in the EPA’s Passive Radon Control System for New Construction. 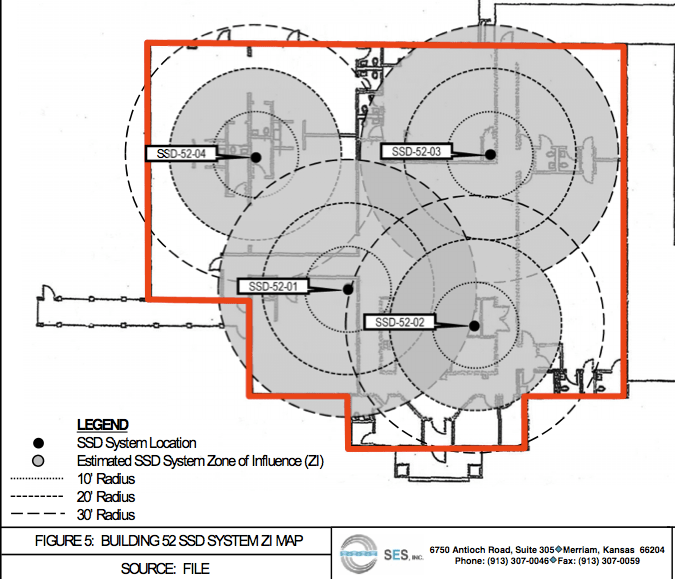 The GSA report found the ideal spacing of the sub slab depressurization system stack locations using an ingenious method to detect soil porosity under an existing slab site. With the rock fill used under our slab, I felt secure in estimating that a similar spacing and radius for our mitigation system would be sufficient. I located out of the way locations for each of the two stacks that I figured our slab would require and drew these boundaries. 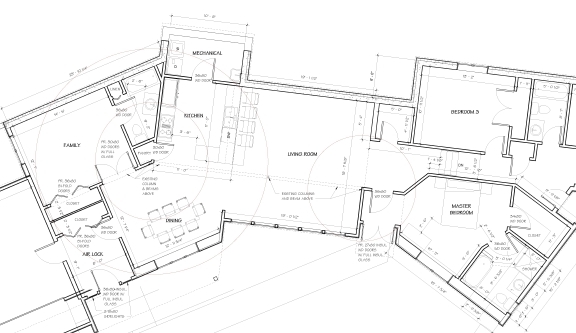 Ten and twenty foot radii are drawn, A thirty foot radius from each port covers most of the slab. As in these requirements, we installed 2 to 4″ of road base aggregate to allow for gas flow under the slab. 4″ PVC T’s were buried in the aggregate as this drawing shows. The slab SSDS pipes were left short temporarily but will be extended through the roof. They were sealed at their bases by taping the 10 mil vapor barrier around them and then the 2″ of spray insulation was sprayed over that. These pipes, along with the edges and the plumbing pipes will also be sealed with caulk as called for in the mitigation requirements. The crawlspace already has a passive radon exhaust system, however we will probably install a fan in all these radon pipes to make them active. Fantech fans are usually used in these systems and are specified in the GSA report. This entry was posted in House Systems, LEED Project, Planning, Radon Mitigation. Bookmark the permalink.